Three seperate news stories have reached Unmutual Towers this week relating to the work of Sir Clough Williams-Ellis, the architect of Portmeirion. 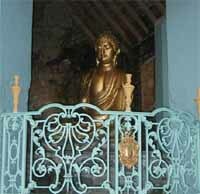 The first is some rather sad news that film production designer John Box, who worked on the film "Inn of the Sixth Happiness" and was therefore partly responsible for the Portmeirion Buddha statue, and the now removed Hercules Bar thatched roof, has passed away. A full obituary can be found HERE. Other news in this week is that the planned redevelopment of the cafe at the summit of Mount Snowdon, built by Sir Clough, described by Prince Charles as a "slum", has hit financial difficulties, with the local authority some £2m short of the required amount needed for the proposed re-build. Click HERE for more on this. We are indebted to Gareth Hughes for this last news story, which is a celebration of a Sir Clough-designed building located in Shanghai! More details on that story HERE. With thanks to Gareth Hughes and Cathy Frumerman for the above news items.